This past weekend my husband, Frank and I rode down to Madelyn and Aston’s house to give Ashton his birthday gift. His birthday is on June 18th. Ashton and Madelyn are two of my grandchildren. Madelyn, age 12 and Ashton, age 8 live surrounded by several acres owned by grandparents, aunts and uncles, even cousins. They live down a dirt drive and you can’t see their house from the road. It has a beautiful pond in the back of the home and half of it is covered with lily pads. Aston tells us that there are a lot of frogs that live there. Surrounding their home is somewhat of a forest that Madelyn and Ashton enjoy making forts in and exploring. If you go and visit Madelyn and Ashton, they love to show you around. Madelyn absolutely loves getting you to hop on the golf cart so she can take you down to see all there is to see on the homestead. That’s what she wanted to do this past weekend. She especially wanted to show Papa Frank around since he has never been site‐seeing with her on the golf cart, so when she saw that Papa Frank had come along with Mamie (that‘s me), Madelyn seized the opportunity to show him around. We all piled onto the cart and Madelyn proceeded to show us everything. Papa Frank rode shot‐gun and Ashton and I took the back seat. Madelyn proceeded to take us and show us the wild hogs that were caught by relatives on the property. She also took us to see Jet and Piggy, their pet goats and then we traveled further down the path, past the cornfields thickly stocked with fresh growing corn. The smell in the air was absolutely wonderful; it smelled of “country” and I loved it! Afterwards, we paused at the chicken house for just a few moments, observing the daily routine of food searching for the chickens. Madleyn drove down paths that had been made by four‐wheelers and golf‐carts, through tall trees and thick brush. It was amazing!!! She took us to a pond where Aston sometimes catches “critters” and then lets them go. But, the most wonderful, fantastic place that she took us was what Madelyn and I named “The Wishing Meadow”. She drives up over a narrow dirt path with a pond on one side and a creek of sorts down a deep ravine on the other. It empties out into this enormous and gorgeous meadow that is hidden from the world, unless you go looking for it. Everywhere you look you can see dandelion seed heads. How utterly amazing and wonderful I thought it was! The first time I saw it, I said, “Look at all these wishes!” I remember when I was a young girl, how I would pick the dandelion seed heads, make a wish and then blow. I always thought that if you blow “all” of the dandelion away from the stem, then your wish would come true. I also remember how my friends and I would hold the bright yellow dandelion flower up in under our chins. 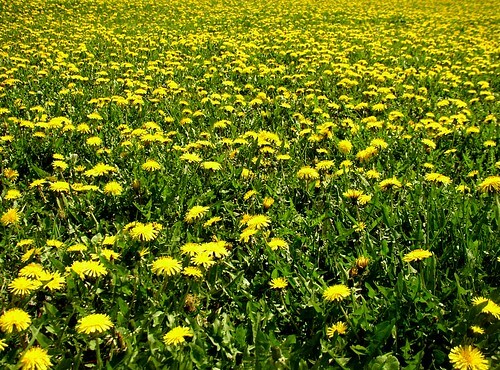 If the dandelion flower put off a yellow glow on your skin, we thought it meant that you loved butter. Madelyn drove the golf‐cart right through all those wishes; all around the “The Wishing Meadow” she drove and when she did she exclaimed, “Oh, Look!” And when we looked, dandelion seeds were blowing all in the air. As if it wasn’t already too beautiful to imagine, God touched it with “His Glory” and it became even more spectacular. I felt that God was giving me a “life lesson” in all of this and as I thought about it, I decided to do a little research on the dandelion. This is what I discovered…and the inspiration and symbolism God gave to me through the Holy Spirit right into my heart is written afterwards. 1. When a dandelion begins to grow, the first thing you will observe are the unusual green leaves. The leaf edges are very jagged or toothed. These leaves appear before the stem, before the small green petals called bracts and before the bright yellow flower that the bracts surround. *Each individual “jagged” leaf reminds me of sin in our lives and how as we grow, our sin will be observed in our lives by others by the way we live. 2. When the dandelion’s leaves mature and before the actual dandelion grows, the tightly wrapped leaf base just above the top of the underground dandelion root resembles a “crown”; a crown of jagged, toothed leaves. *I, of course, immediately thought of the crown of thorns that was placed on the head of Jesus at His crucifixion. He is King of Kings and the Lord of Lords. How appropriate, I thought, that there would be a crown above what I felt was symbolic of Jesus Christ…the root of the dandelion, as you will read below. 3. The dandelion is the only flower that represents the 3 celestial bodies of the sun, moon and stars. The yellow flower resembles the sun, the seed head resembles the moon and the seeds, when blown, resemble stars, and yet it is one flower. *God the Father, God the Son and God the Holy Spirit comes into our life as One, yet He is Three in One. God the Father, being our Father in Heaven, God the Son who is God our Father’s Son named Jesus, who came to earth as flesh to save us from our sins and God the Holy Spirit being His Holy Spirit that comes to live within us when we accept Him as our personal Lord and Savior. 4. The stem of the plant is hollow, and when broken a sticky white bitter sap will ooze out. *When I thought about the stem of the dandelion, how it is hollow inside, I thought about how we are hollow inside until we accept Jesus Christ as our personal Savior and He sends the Holy Spirit to live within us. And, I thought how the dandelion oozes when broken with bitterness. I thought about the times when we are broken in spirit, before we come to know Christ. And when we accept Him, the bitterness leaves us and what oozes out of us is joy. 5. The flower of the dandelion is shaped like a circle and is bright yellow. It is symmetrical, meaning if you were to fold it in half, it will look the same on both sides. *What God put in my spirit about this, I thought interesting. When we accept Jesus Christ as our personal Savior, we are like a shining light somewhat like the dandelion when the bright yellow flower comes into bloom; people often can see the love of Jesus in our faces. The dandelion blossom is symmetrical. We, as children of God, are also symmetrical, meaning if it were possible to look into a Christian’s heart, you would see the same love of Christ as you would see in the face of a child of God. 6. When finished flowering, the dandelion flower turns to seed. The whole head of the flower will close up and the green bracts underneath the flower will close around the seed. The yellow petals will disappear and the seeds mature. Then, this new seed head will open up. These big puffy white seed heads, when blown by the wind, or should I say when blown by God, or by us, or even scattered by a golf‐cart, can start 200 or more new plants per dandelion. 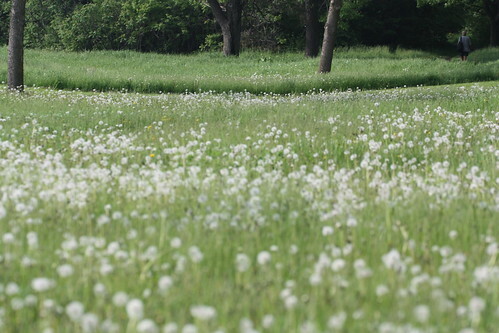 I wonder how many new dandelions will begin because we drove through “The Wishing Meadow” on a golf‐cart. *This one was really amazing! As a Christian walks with Christ and matures, just like the dandelion’s head closes up and the green bracts underneath the flower close around the seed, the Child of God’s head bows, eyes close (flower head) and hands (bracts) fold in prayer. The seeds are maturing as they experience more and more of Christ and the child of God begins to tell of their experiences, spreading the seeds (seed head) with others wherever they go by sharing the love of Christ and His goodness. When a Christian shares what Christ has done for them, how many lives can be touched. How many new believers can come to Christ through one Christian sowing seeds of Christ’s love? 200, like the dandelion? Well, think about it this way. You share with one person and that person shares with another and that person with another and on and on and on. The domino effect begins and there is no telling where it ends, it is most likely, I would say, eternal; much, much more than 200. 7. Dandelions are one of the most familiar sights of spring, though not welcome by some. They turn green lawns and pastures yellow with their flowers. Dandelions grow in a funnel shape. Starting from the base of the plant, the leaves have slim stalks, but grow wider towards the tip. This helps any falling water like raindrops to run down the center of the plant right to it’s long root where it needs it. *Christians can usually be seen on Sundays together at church with their “smiling” faces in the sanctuary just like bright yellow dandelions on the lawns and in the pastures. With hands uplifted in prayer and praise, they are shaped like the description of the dandelion above…slim stalks, but growing wider toward the tip, creating a funnel shape. The same way that being a funnel shape helps the dandelion to catch raindrops that fall, a Christian’s hands raised in prayer and praise helps them catch the power of the Holy Spirit of God. And, like the fact that dandelions are considered weeds by some people and not welcome by them, Christians, also, are not welcome by some when they share Christ’s love to others. *This one I had to think about, but then God gave it to me…when the dandelion’s plant and flower is removed, it actually gets more than one chance to bloom. The dandelion has a very strong root, and if that root is not removed, it serves as an intercessor to nourish and to bring this plant back to life over and over again even if the plant and flower are removed. Jesus Christ is a Christian’s intercessor; He is our “strong root”. He seeks to nourish us back to life when we stray away from Him. And, He is always there for us holding our place with Him while He yearns for our return. When we do return, just like the dandelion blooms a brand new blossom, Christ forgives and accepts us back as brand new!! 9. The dandelion flower opens to greet the morning and closes in the evening to go to sleep. *God opens each brand new day for us with light from above and He closes each day with the beauty of darkness. 10. Every part of the dandelion is useful; the root, stem, leaves, and flower can be used for medicinal purposes and the color of the dandelion can be used for dye. All parts of the dandelion contain several vitamins and is completely edible. *God created each of us special with a specific purpose. Just like many of us didn’t know about the dandelion, many may not know God’s specific purpose for their lives; however, the purpose is still there waiting to be discovered. Will you ever look at the dandelion the same? I don’t think I ever will. Such a beautiful blog about the Dandelion and the Child of God ‚like the other blogs it really touched my heart. This would be a good sermon to use in church ! To comment on Healing Reign Ministery , in the short time I have known Carolyn and you ‚I’ve come to love and respect you two very much ! That mainly stems from knowing the big hearts you have,filled with love for other people and the Lord himself.I have no doubt in my heart that Healing Reign Ministery will be well Blessed ! You all are close to my heart and in my prayers ( Carolyn,Diane,Healing Reign Ministery,and most of all those who God puts in your path ! ) I pray ernestly for those who are struggling with making the decision to get help with their addictions.They can take it from someone who knows, that God can make it happen and life is so much better !! !